When you own a property in Bulgaria, it is incredibly important to make sure that it is properly cared for in your absence. Our Bulgarian Property Management team has one goal: to help fellow foreign buyers make the most of their Bulgarian home. Pride were the first company to establish specialized Property Management services in Bulgaria, and for the past ten years we have gained unbeatable experience in dealing with the country's' bureaucratic obstacles. We have a knowledgeable, caring team of Bulgarian and British staff and a proven network of support people across the areas we cover. Our Bulgarian homecare service is second to none! A home in Bulgaria will offer years of enjoyment and a great return on investment. The hot summers, snowy winters, rural villages and simple way of life have attracted thousands of foreign buyers to the country. But these factors also mean it is vital to have someone taking proper care of your investment property in Bulgaria. We will set up a bank account for you and make all payments for your property's bills. We can set up all the necessary contracts on your behalf with local police, TV, internet and insurance companies. We will transfer your utility accounts into your name, provide readings to these companies and pay the bills on your behalf. We keep a simple running statement showing all your expenses. 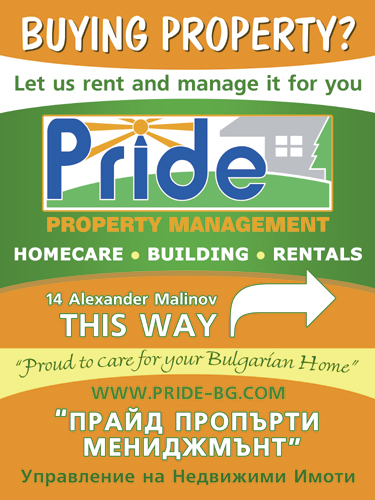 For all quotations and Bulgarian Property Management services please don't hesitate to contact us! We work in all of the following main municipal areas: Varna, Balchik, Kranevo, Kavarna, Dobrich, Provadiya, Valchi Dol, Obzor, Byala, Shkorpilovtsi, Dolin Chiflik, Avren, Devnya, Aksakovo, Suvorovo and Vetrino. Broadly speaking these areas are al located on or within 1 hour's drive of the Black Sea Coast and Varna. These are some of the most popular villages in these areas: Kalamantsi, Kichevo, Oreshak, Ossenovo, Staro Oryahovo, Venelin, Pchelnik, Zdravets, Zvesditsa, Benkovski, Sadovo, Kitka, Priseltsi, Galata, Ravna Gora, Kymanovo, Golden Sands, Albena, Obrochishte, Sokolovo, Senokos, Manastir, Dobrina, Levski, Topola, Bojurets, Gurkovo, Tsurkva, Stefanovo, Rogachevo, General Kantardjeivo and Klimentovo. We will visit any town, village or villa zone in this general area so please do contact us for further advice.